Artist's rendering of the Fred & Pamela Buffett Cancer Center. 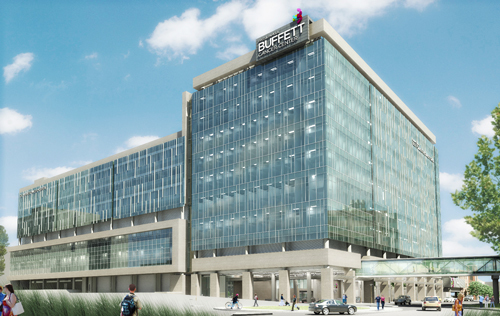 An artist's rendering of the Fred & Pamela Buffett Cancer Center. A recent all-day review of design documents for the Fred & Pamela Buffett Cancer Center presented project team members the opportunity to meet with architects and engineers to ask detailed questions, provide comments and offer suggestions. Completion of the design development phase is a critical milestone in determining the overall project scope, according to Don Mohlman, project manager. HDR, Inc. has prepared more than 1,000 pages of drawings and four volumes of preliminary specifications in preparation for owner review and cost estimates by Kiewit Building Group. Once the design development phase and budget are approved, the project will move into the construction document phase, which involves the production of documents necessary for the construction of the project. The project represents one of the largest construction jobs ever in Nebraska. The $323 million project includes a multidisciplinary outpatient clinic, a 98-lab research tower and a hospital tower with 108 beds dedicated to oncology patients. Expected occupancy for the Fred & Pamela Buffett Cancer Center is 2017. As an employee of the Eppley Institute, I find this to be so exciting! I have never been a part of something this big and significant and I am looking forward to futures updates of progress for this expansive and beautiful building.